Why theater? : That is a tough question. Sort of like, why have brown hair? Theater has always been a part of me, and who I am. I have always been a storyteller and have loved the art of how stories are told. So when I was in my first show at nine years old, I knew I had found my place. I feel at home on the stage. There aren’t many other things that I would say that about or that I find as gratifying. Being part of telling a story that will hopefully move every single person in the audience to feel something or to think about something is an incredible rush. There is no greater compliment to me than to know that audience members continue to discuss a production I have been in, after the curtain comes down, rather than simply leaving their experience at the door to the theatre. Every time I do a show I learn something new about myself, as well; whether it is a character I am playing shedding light on an aspect of my personality, or honing my understanding of theater, or discovering new tactics for my rehearsal/performance process. And finally, the theater community is one of the most tight-knit, loving, supportive communities that I have ever been lucky to be part of. I am constantly forging bonds that will last a lifetime. Tell us about FriendAndy.com: FriendAndy.com is an incredibly topical piece, speaking directly to the pop culture staple that the internet, and more specifically social media, has become. It is the story of a blogger named Andy who sets his sights on making himself a viral success using a series of comedic characters he creates to share his commentary on life. The show addresses what happens when someone quickly achieves international digital fame, by showing the audience how it changes Andy and how it changes us. Us, being the viewers/supporters/consumers of his “product.” One way that this is accomplished, is through the portrayal of all the characters that drive Andy’s story. 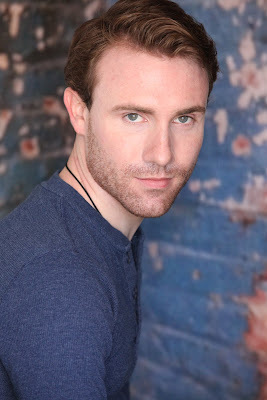 One actor (Hayes Dunlap) plays Andy for the entire show. The other three actors (Laura Kaldis, Nastasha Strang, and myself) play anywhere between ten and fifteen different characters. The three of us are credited as “Stage Hands,” a title which is purposefully left very vague. All four actors are on stage almost the entire show; and so when the Stage Hands are “between characters,” that is, on stage but not actively in a scene, we are taking on the largest role that each of us plays. A lot of discussion went in to what that role is exactly, and I could tell you what our thoughts were, but I think it would be more beneficial and more fun to leave that interpretation to our audiences. The show breaks down many theatrical conventions, and from the get-go asks the audience to go on a journey with us where they will need to be open-minded about how this story is told. Adapting a 20-something’s digital life to the stage is an extremely difficult feat, since all interactions are done in front of a screen (whether it is a computer screen, or a cell phone), but it has been interpreted with beautiful dexterity by the Playwright/Director, Wesley Fruge and by our Choreographer, Karesia Batan. There are several non-speaking movement pieces scattered throughout the play that are pivotal in communicating aspects of Andy’s story. They are so precise in what they are doing, that it was essential to have someone who could choreograph the movement, as well as communicate the importance and unity of body language in these pieces. What is it like being a part of FriendAndy.com? : FriendAndy.com has been the best kind of adventure and challenge that an actor can have in theater. To begin with, most of the current cast and creative team have been developing the play over the past ten months. I have never been attached to a play where I am able to watch it grow, grow with it, and have influence over how it grows. Since, I got cast in FriendAndy.com it has gone through three versions of the script: two staged readings and now a third more complete production. Every single scene in the script has gone through changes over this time, whether they were very minor alterations, or complete overhauls of a scene or character. Wesley has always been amazingly open to feedback not only from his actors and fellow creative team, but also from the audiences that have seen previous readings. Needless to say, it has also been a huge challenge to be actively in a character for a complete ninety minute show. Over the rehearsal process, we spent a lot of time talking about transitions from character to character, in addition to the role of our “neutral” character when we are between scripted characters (that is, characters with dialogue). At one point in the show, I go through four different character transformations over the course of approximately a minute and a half. At first, this was a really daunting thought, but it has grown to be one of my favorite parts of the show not only because of the challenge it poses to me as an actor, but also because of how pivotal that series of transitions is to the story at that moment. On a somewhat separate note, this process has also been one of the healthiest that I have ever worked on. Everyone associated with this production has been incredibly supportive of one another. Working with such an intricate and distinctive script was very difficult, but I never felt uncomfortable taking risks because I knew that everyone else was also finding their way and would be there to catch me if I fell. What kind of theater speaks to you? What or who inspires you as an artist? : I am a big fan of theater that challenges the way that I think. I know that seems obvious, but the kind of theater I find myself appreciating least, is theater that can be taken at face value: something that leads to no conversation after the performance. However, “what I think” can be interpreted very broadly. It could be what I think as a person: a piece that challenges my beliefs, or forces me to look at something I thought I knew well from a different perspective. Or it could be what I think as an active member of the theater community: typically breaking theatrical conventions for the sake of communicating the story. Consequently, as an actor, I am always challenging myself to dig deeper in to a piece, or character, to attempt to provide some sort of post-show discussion for audiences who see me perform. There are many things and people that inspire me as an artist, but most recently I have fallen in love with Dan LeFranc’s writing. I met Dan while working on his production of The Big Meal at Playwrights Horizons this past spring. The play blew me away and moved me to seek out his other works. Dan, in my mind, is an extremely skilled artist: He writes plays about people, rather than about an event(s), and allows the content of the play inform the structure of the script. In the past, I have referred to him as the Michael Cunningham of the stage. For example, The Big Meal tracks an early-20s couple from their meeting, all the way through their later years – replete with all of the people who come and go from their lives (all portrayed by eight actors). Every single scene takes places in a restaurant or at a dinner table: a common ground for family gatherings. The play is written with such a heightened sense of realism, that there are typically multiple conversations going on at once, and people constantly talking (or shouting) over one another. Dan knew how he wanted his show to sound, but was not sure how that was going to be executed on the page. The final version of the script was printed in landscape orientation on legal paper divided in to eight columns: one for each actor. This not only allowed the script to maintain organization, even within extremely chaotic scenes, but also provided a visual map of the show. When you look at the script you can see where the play is loud and where there is silence, and for Dan, finding those moments of silence was very important. Any roles you’re dying to play? : All of the roles that I am dying to play, at the moment, are too old for me! Also, most of the roles that have spoken to me in the past come from musical theater. I would love to play Javert in Les Miserables, Sweeney in Sweeney Todd, and also Luke in Next Fall. What’s your favorite showtune? : I think my favorite showtune may be "Soliloquy" from Carousel. Not only is it an incredible piece of music by Richard Rogers, but the story that Oscar Hammerstein III is telling through Billy’s eyes is amazingly moving. Billy goes through more changes as a character in that eight minute piece of music, than many characters do over the course of an entire play. If you could work with anyone you’ve yet to work with, who would it be? : I would love to work with Denis O’Hare at some point. Denis is a hugely versatile actor and has never ceased to amaze me either on the stage, on film, or on television. He was an acting teacher of mine a couple years ago and in the few short weeks we worked together, I learned a massive amount. I can only imagine that working along side him would be just as beneficial, or even more so. Denis is also one of the most genuine, caring people that I know. Who would play you in a movie about yourself and what would it be called? : Right now, I would say that John Gallagher, Jr. would play me in a movie about my life. I’ve been very impressed with him recently on HBO’s "The Newsroom" and I think that he would be able to capture my personality very well. As to what it is called, that is still in the works. What show have you recommended to your friends? : Most recently, I was recommending The Big Meal at Playwrights Horizons and Death of a Salesman on Broadway, both of which have since closed. I have not had much time to get out and see theater the past couple months, so I am a bit out of the loop at this point. What’s your biggest guilty pleasure? : Haagen-Dazs’ White Chocolate Raspberry Truffle. Hands down. What’s up next? : At this time, I do not have anything lined up for myself, so it will be back to auditions. The life of an actor.